Monrovia – The FrontPageAfrica has very reliably been told that Senator Prince Y. Johnson of Nimba County has reportedly proposed a constitutional amendment to give President George Weah a lifetime Presidency. He’s alleged to have made the suggestion during a called meeting between senators and President Weah recently. According to well-placed Legislative sources, Sen. Johnson’s suggestion was, however, brushed aside by some of his colleagues because that was not the intent of the meeting. However, our sources said some influential senators sat and didn’t rebuke Sen. Johnson for his callous proposal. They (sources) disclosed that the gathering was a mediation meeting between the President and Vice President Jewel Howard-Taylor. Last November 2018, the VP’s office issued a statement in which she reassured the nation of her commitment and loyalty to the advancement and implementation of the “Pro-poor Agenda for Prosperity and Development (PAPD) as enunciated by President Weah. Before this time, there had been reports of serious rifts between the two most powerful persons in the country and so the VP’s Office sought to quiet down the rumors. Most people had thought that the alleged divide, as the President’s Office had never admitted to it, was done and over with. However, the Senate’s recent intervention shows that indeed there was/is a conflict that needs mediation. Our legislative sources further disclosed that their recent mediation was part of ongoing efforts by a visiting Nigerian Prelate, who has been in Liberia for the past few days holding conciliation talks between President Weah and Vice President Taylor. Rev. Mother Esther Abimbola, a Nigerian Prelate is reportedly in Liberia by an invitation from Vice President Taylor. It is said that as a part of the visit, she is to mediate peace between the President and his Vice President. “Yes! He actually made those comments that if possible the legislature should amend the law to give the President life-time tenure and that was not the reason why we had gone to see the President. “We had actually gone to mediate between the President and the Vice President. As you are aware, the President and Vice President have not been on good terms so as elders, we felt it was necessary to intervene that was the purpose of the meeting,” one of our legislative sources further disclosed. Senator Prince Johnson is on record for telling Liberians that a war would have sparked off if George Weah had won the presidential election, which was held in 2017. He made the statement during the campaign period of the elections. He had even initially urged his kinsmen and women not to vote for George Weah, candidate on the Coalition for Democratic Change’s ticket. However, in the second round (runoff) of the election, Sen. Johnson, who was no longer qualified to be a candidate, chose to throw his weight behind candidate George Weah. Reports emerged that he was giving his support to Weah so that should he win the Presidency, he would create a shield against any discussions or establishment of a war crimes court. 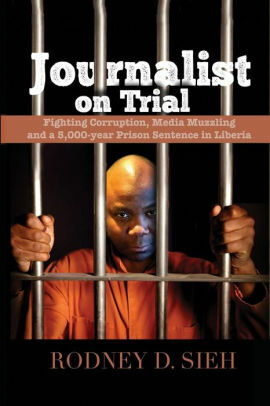 Senator Johnson is a former rebel leader, who is on record of committing some of the worst atrocities and crimes against humanity during Liberia’s civil war, which ended 15 years ago. According to Liberia’s Truth and Reconciliation Commission (TRC), the Independent National Patriotic Front of Liberia (INPFL), Johnson’s warring faction, can be held liable for just two percent of the total violations —2,588 —tallied in its final report. However, the TRC documents the Senator as having the highest number of violations ever recorded for individual perpetrators during the whole civil war. In addition to killing former President Samuel Doe, the TRC documented other crimes committed by Johnson’s INPFL: “Two trucks filled with native Krahns and Mandingoes were captured from ECOMOG by the INPFL and apparently killed since they were never accounted for,” the report reads. Among Senator Johnson’s violations, according to the TRC, are killing, extortion, massacre, destruction of properties, force recruitment, etc. Should a war crimes court be established in Liberia, the Senator would likely be made to appear before it. 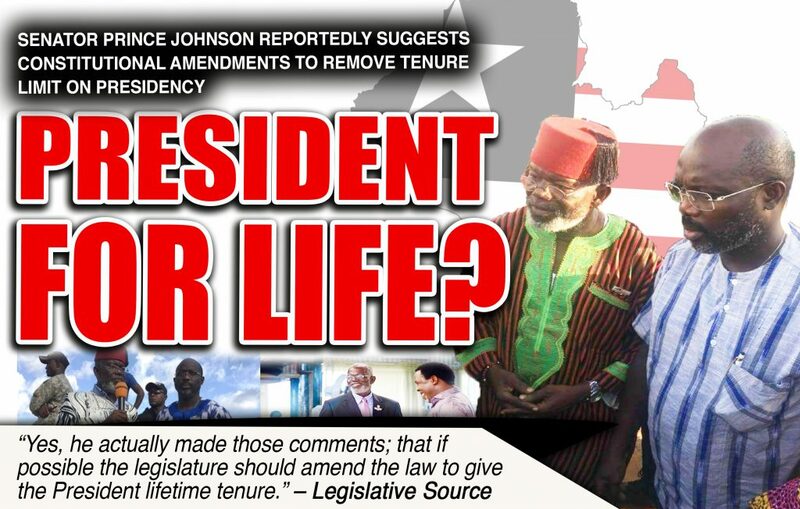 So, alleged assertions made by Sen. Johnson that the Legislature should consider amending the law to give President Weah a lifetime job confirms that he doesn’t want to face justice for alleged crimes he committed during the Liberian civil conflict. The Nimba County Senator is, however, not the only person, who has made similar statement to give the President a lifetime position. Finance and Development Planning Minister Samuel Tweah and Representative Munah Pelham-Youngblood are on record of making this call, too.